THE GLEN OF Imaal Mountain Rescue team in Wicklow has reported over 60 callouts so far this year, crediting the spike in incidents to the recent hot weather. Chairperson of the rescue team Brendan Beirne said that it has been an exceptionally busy time for them. There were tasked to six callouts on one particular Saturday during the heatwave. “There has been an increased number of heat-related incidents in recent weeks with the exceptionally hot weather. The Glen of Imaal Rescue Team responded to 80 call outs in the Wicklow Mountains, according to data released yesterday. 70% of those were for rescues while the remaining callouts were for searches. The data collected by the Irish Red Cross found that weekends were the busiest times for the team with most incidents happening on Saturdays (33%) and Sundays (32%). As the summer season continues Beirne expects the rate of call outs to increase and has asked people to take extra care while out hiking. “With the weather so warm our warning to people would be to remember suncream, a hat, keep shelter and drink plenty of water. Heat exhaustion is a big possibility for hikers, something we don’t see very often. For the Wicklow based volunteers, Glendalough had the highest number of callouts last year. 2013 holds the record still for the highest number of incidents with 110 callouts. The rescue team say this was due to the snowy conditions in the mountains that attracted people from Dublin where there was no snow at the time. The Glen of Imaal team was called out to evacuate people trapped in their cars who were at risk of developing hypothermia. 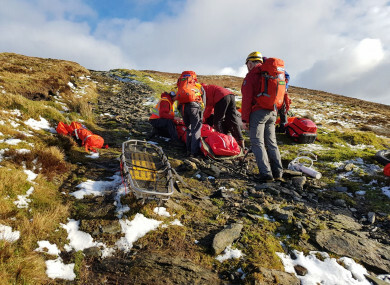 The team provides a 24-hour, 365-day search and rescue service for the Wicklow and Dublin upland areas. “We work in close proximity to the largest population centre in the country, and that’s why we’re so busy,” Beirne said. Email “Hikers warned of 'heat exhaustion' as warm spell leads to spike in mountain rescue callouts ”. Feedback on “Hikers warned of 'heat exhaustion' as warm spell leads to spike in mountain rescue callouts ”.